Who can play? 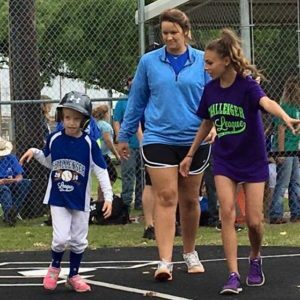 Youth and Young Adults, ages 4 and older, who are differently-abled will be eligible to participate in Challenger League Baseball. How are the teams divided? Teams are determined by skill level and ability. Each player is placed on a team suited for his or her abilities. Players 4-18 will be placed on Challenger Little League teams. Players 19 and older will be placed on Senior league teams. Players 15-18 may be placed in either level. How much will this cost? There is no registration fee. Each player should provide his or her own glove, shorts/pants, socks and shoes. The team sponsor will provide a hat and shirt. Interested in Coaching? Email us at challengerleaguewaco@yahoo.com for more information. When is the season? Tryouts will be held on March 9, 2019. New players should report at 9am and returning players should report at 10am. Senior League players should report at 10am as well. 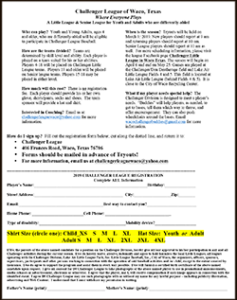 For more scheduling information, please visit the league Facebook page Challenger Little League in Waco Texas. The season will begin on April 6 and end on May 25. 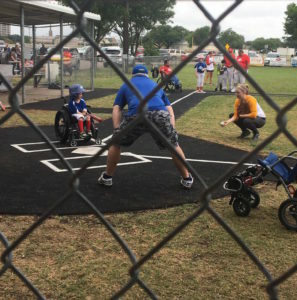 Games are played at the Challenger/Don Deatherage field and Lake Air Little League Fields 4 and 5. This field is located at Lake Air Little League (behind Fields 4 & 5). It is close to the City of Waco Recycling Center. What if my player needs special help? The Challenger Division is designed to meet a player’s needs. “Buddies” will help players, as needed, to get to bases, tell them which way to throw, and offer encouragement. They can also push wheelchairs around the bases. Email wacochallengerbuddies@gmail.com for more information. Tryouts will be held on March 9, 2019 and we ask you to PLEASE bring this paperwork as it helps us assist in ordering shirts and uniforms. >> Click below to download Registration forms!